Imagining the future can be daunting, but The Thing from the Future card game makes it fun. While its creators the Situation Lab (a project of artist/designer Jeff Watson and Long Now fellow Stuart Candy) simply call it “an imagination game”, it’s quite an elegant factory for generating alternative futures. Through collaboratively and competitively describing objects from a range of possible futures, The Thing from the Future players confront questions about the near and long-term future from unconventional vantages that yield creative solutions. Each round of the game begins with a collectively generated creative prompt that describes the type of future a yet-to-be-imagined object comes from, as well as where it fits in a given culture or society, what kind of object it is, and what sort of emotional reaction an observer from the present might have when confronted with it. The player who comes up with the most compelling future scenario wins the round. The Thing from the Future underscores how the constraints of generative systems can be used to inspire long term thinking. In their 02006 SALT talk Playing with Time, Brian Eno and Will Wright discussed the role of generative systems in their respective fields of music and game design. Whether a game of chess, a computer simulation of a city, or a piece of music, from a simple set of rules, or “seeds,” complex futures emerge. Changing any one of these rules vastly affects the future outcome. In the case of The Thing From the Future, the constraints are the key to enabling players to break out of traditional patterns of thinking about the future. In that sense, The Thing From the Future evokes Eno’s Oblique Strategies, a card game of aphorisms that the artistically-inclined are encouraged to turn to in moments of creative blockage. For example: “Do nothing for as long as possible.”. “Repetition is a form of change,” reads another. 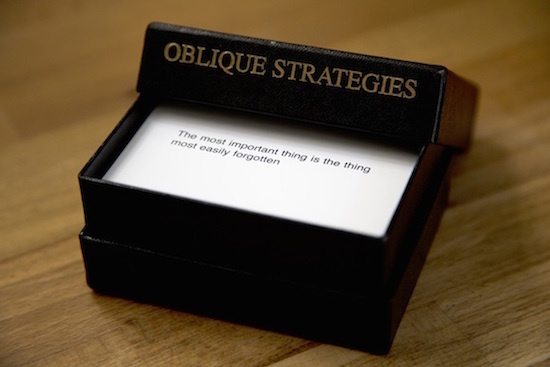 The Oblique Strategies evolved from me being in a number of working situations when the panic of the situation – particularly in studios – tended to make me quickly forget that there were other ways of working and that there were tangential ways of attacking problems that were in many senses more interesting than the direct head-on approach. In much the same way that Oblique Strategies inspires “tangential” ways of thinking in moments of creative panic, The Thing from the Future grounds musings about the future and turns them into concrete scenarios. The Thing From The Future, while intellectually stimulating, is at its core, fun, and meant to be played by anyone. You can buy it online here or stop by and ask to use the deck we keep at The Interval (open daily from 10am-midnight).